It begins with a gruesome account: a tourist, paddle-boarding and swimming in an idyllic setting baked by sun – in this case, Cid Harbour in the Whitsundays, Queensland – attacked by a shark. He suffers a massive loss of blood; he goes into cardiac arrest. The accounts that follow are just as predictable as the consequences of the shark’s work: a hunt for the animal, a debate about how best to curb future attacks, and an attempt to minimise adverse publicity for the tourist industry. Marine biologists such as Blake Chapman have also made it into the news with cautionary notes, but there is a feeling that calm heads are about to be lost. “We really need to be smarter than what we have been and actually learn from these things as opposed to just going out and killing animals.” The increased number of attacks could, surmised Chapman, be the result of a range of factors: the movement of shark food sources in the area, increased rainfall or changes in water temperature. According to Inspector Steve O’Connell, the Whitsunday area was not famed for its vicious shark attacks, featuring the odd “minor” nip and bite without more. With each attack, calls for further action in what resembles a guerrilla campaign are made. The human tribe, going on ritualistic rampage, demands retribution. The September attacks precipitated an all too familiar reaction: a needless, bloody cull that did little to either address the issue of swimmer safety nor the behaviour of the animals in question. In 2014, when surfer Sean Pollard lost an arm and his other hand near Esperance, the West Australian Barnett government took little time to implement what it termed an “imminent threat” policy. A shark spotted near a popular beach was essentially fair game, to be preemptively slaughtered irrespective of how many people might be swimming or present in the area at the time. To make matters that much murkier, Pollard himself expressed doubt as to which animal was necessarily responsible for his injuries. Two bronze whalers came to mind. Such policies, as Christopher Pepin-Neff observes in The Conversation, are based on the slippery foundations of myth: “individual large sharks pose a threat because they are territorial. A shark that bites someone is likely to do it again, and even if there is not an incident now, it is better to kill the shark because it may return.” These are the fictional “rogue” sharks, “problem” animals which supply the stuff of fantasy for confused policy makers more disposed to vengeance than accommodation. Not being of the cuddly sort, sharks lie in the disturbed archive of the human unconscious, a monster that all too readily becomes a target and focus when an attack is reported. “Myths and monsters,” Marina Warner reminds us, “have been interpliced since the earliest extant poetry from Sumer: the one often features the other.” We are not only fearful, but wish to be entertained by fear. When the more innovative instincts of the human species kicks in, the monster can serve various useful purposes, be it as weaponry or medicine with fictive, healing properties. In August, the opening of The Meg, an adaption of the first of Steve Alten’s six-book horror sci-fi series, again featured that old monster versus man motif, with the naval captain, Jonas Taylor doing battle with this intimidating resident of the sea, the megalodon. (To give the trope added ballast, Taylor is played by veteran action hero, Jason Statham, “the most fearsome type of human being to have ever lived” muse Luke Holland and Stuart Heritage in The Guardian.) Reduced to celluloid and animation, a remarkable animal becomes the marine nightmare dangerous and nigh impossible to tame, terrifying humans young and old. The obvious point – that humans don’t tend to feature high on a shark’s menu list – is assiduously avoided. As Vivienne Westbrook of the Oceans Institute based at the University of Western Australia cautions, “fictionalised versions, with their threatening fins, chomping jaws and general grudge against humanity, have tended to blind us to what is truly amazing about sharks in our oceans.” But being blind is actually what the human species is rather good at, relapsing into fits of retribution that serve no purpose other than to satisfy a brief communal lust for revenge. The monster, even one whose predecessors have been on this planet for 450 million years, will be hunted and killed – by the tens of millions, if need be. SHARKS LIVE HERE: Enter the water at your own risk. The expense of the clean up, after you have willingly offered yourself as food, will be extracted from your estate, or your family. No counterclaims accepted. The signs can be amended to suit any public activity, eg: selfie-takers falling off cliffs, or any other non-thinking irresponsibility undertaken by Darwin Award candidates. My philosophy on sharks has always been simple. If they come into my home I will defend my home from them. If I go into their home. I expect them to do the same. Killing a shark for acting instictively in it’s own environment does little to teach other sharks nor does it alter their instincts. Six and a half hours! Geez, you a bloody Sunday driver or wot? I could do it in half that time in me Ford. I have no fear of dying because my parachute failed to open. Likewise, I have no fear of dying in the jaws of a shark. Yes. As someone said on the Drum last night, the ocean is their patch. They wont bite you,especially if you avoid locations notorious for their presence, such as in parts of WA and Eyre Peninsular SA. You can add Kangaroo Island to that list, Paul. We used to get some bigguns over there. Btw, do you remember Big Fred? He was sighted regularly off Glenelg in the late 70s and was alleged to be over 30 feet long. They later changed its name to Big Freda after it was discovered Fred was a female. Was lucky to get off the island alive with all those sharks circling it; those peninsulous tiger snakes (which until a new variety of snake was discovered in Africa in the 80s was the world’s most venomous land snake); and then there was the famous triantelope – spiders as big as sheep dogs. One wonders if’n shark attacks are increasing?? and If so, why? Sharks are an predator species, no kidd’n, right. If’n the sea’s are over fished..if’n there are expanding oxygen dead zones in the Pacific etc , if’n there are less tucker breeding area’s because of bleaching …then surely, that means there’s less food ‘all round’, some times options present and some human fills the degustation gap. If you don’t enter the sewer, sorry, ocean. …then you won’t be on the menu, but if you do enter the sewer, sorry, I mean polluted morass, then your on the menu. 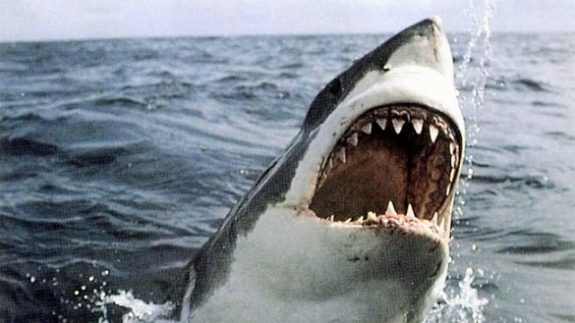 Next time you go to the beach think Climate Change, think over fishing….and cue the Jaws music…da dummmp..da dummmp…no, really 😉 Shark attacks are increasing and are happening in area’s not known for shark attacks…one wonders? ?